It could mean the end of the toothpaste tube – and the waste they create. But a Florida-based startup has a new pod design that dissolves in seconds. Called Poppits, this biodegradable softgel pod melts in your mouth within five seconds and releases the dentists-recommended amount of toothpaste – without the mess or waste. Toothpaste packaging is designed to last forever and a typical household tosses at least one in the garbage every month. These everlasting tubes are produced with aluminium or plastic, and the chemicals found in toothpaste also wreak havoc on animal hormones and of course, the environment. Poppits says the toothpaste inside their pods is fluoride-free with natural ingredients – no animal fats have been used in their products. Each 100 percent biodegradable pod consists of Clycerin, Sorbitol, Water, Silica Xylitol, Calcium Carbonate, Peppermint Essential Oil, Betain, Cellulose Gum, Stevia, and Tea Tree Essential Oil. And the outer coating is made from an edible plant-derived cellulose film that consumers pop in their mouth and melt within five seconds of brushing. The only part of Poppits that doesn’t disappear right away is the paper packaging. However, the firm has designed a cutting-edge unit that fully decomposes within two to 12 weeks, as it is completely made of recycled material. 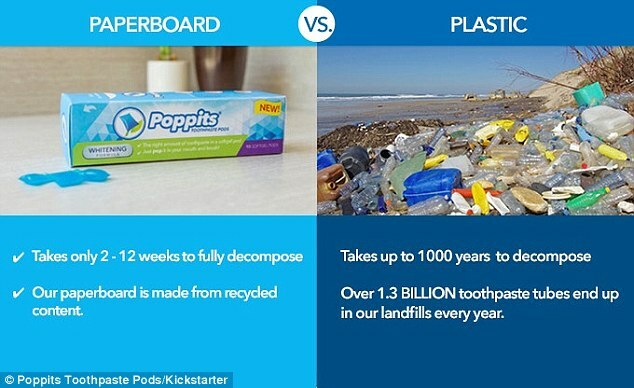 ‘We are passionate about bringing Poppits to households around the world and reducing plastic pollution,’ the firm shared on a new Kickstarter campaign. The startup is seeking $50,000 dollars and has received $40,616 from 771 backers. Poppits comes in two varieties: Whitening Poppits for adults and Kids Poppits, which comes in ‘fun fruity flavors’. Kids can choose between sweet strawberry, green apple and merry berry, and the firm is working on additional flavors and formulas included a natural fluoride version. ‘It’s always hard to get that last bit of toothpaste from a rolled-up squeezed tube but with Poppits you get it all! Right down to the last fresh pod,’ said Poppits. Poppits will be using the money raised via Kickstarter to start manufacturing the product and is set to start shipping the pods in October 2016. By pledging $12, consumers will receive a package of Whitening Poppits, there is now news yet about the retail price for these 100 percent biodegradable pods.